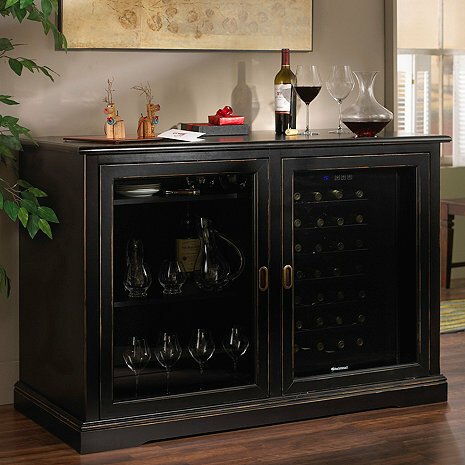 This Siena Mezzo Credenza does NOT include a Wine Refrigerator. 2 spacious storage areas each with sliding pocket glass doors, 2 adjustable shelves, and room for our 9-glass Stemware Rack* (sold separately). Either area will also fit our 28-Bottle Touchscreen Wine Refrigerator, sold as a set with the credenza if what you need is the ultimate service center. Color swatches are available. To obtain one please contact a Sales or Customer Service Representative at 800.356.8466. Mon, May 6 - Wed, May 15. With White Glove Delivery, we bring your item into your home, unpack it, inspect it, place it where you want it to be, and dispose of the packaging. Delivery is by appointment. We will call you to set a date. If you'd like to arrange a Saturday delivery or schedule a specific delivery date, feel free to call our Wine Cellar Specialists at 800-377-3330. Please note that Stair Charges may apply for locations with 5 or more stair steps. White Glove Delivery rates apply only for orders shipped to the contiguous 48 US states. For orders shipping to Alaska, Hawaii, Puerto Rico, APO/FPO, or islands off the US (i.e. Martha's Vineyard, Kiawah Island, etc.) addresses please call 800-356-8466 for additional rates. Sorry, we cannot ship items to a P.O. box. We have been using our Siena Mezzo Wine Credenza for several weeks now, so I figured it was time to write a review. This is a very nice wine cooler and a very nice piece of furniture. The credenza is a quality piece that fits very well with the rest of our house. It is in the family room area, so it is very visible. The coolers work very well and are really quiet. That was a concern due to the location we had selected for the credenza/cooler. When the house is very quiet, they can be heard, but the sound is very low and not at all disruptive. I would recommend this unit to anyone who is interested in a credenza style cooler. Since the unit was purchased for use in California, it was not possible to order the standard 28 bottle coolers. Not sure why they are ok in the rest of the USA and world, but welcome to California. This unit was ordered with the 20 bottle coolers which do work very well and are quiet as mentioned earlier. The only negatives are that they do not "fill up" the credenza and it is possible to see the top and bottom of the coolers through the glass doors. They also have stainless steel trim which makes them more visible. I do store whiskey glasses on top of the coolers and this makes a good use of the space and fills up the gap. They also only hold 20 bottles of wine rather than 28, more would be better. Great unit, would recommend to anyone. Love the color great size for the area. The Nero blends well with the rest of our cabinets ,expresso. Outstanding piece of furniture looks great we’ll build.